CLASSIC, luxurious and sumptuous, velvet is still on-trend in a big way for 2018. Both for fashion and interiors, but most especially interiors, with the plush fabric and the gleam of the pile, velvet adds instant luxe to any space in the home. The velvet trend ramped up in 2016 but has now morphed into the mass market, increasing choice and affordable options. Most of us think of plush velvet as the fabric for cooler climates but not necessarily so. There are plenty of cotton velvet options now available in cooler colours that are perfect for our climate. As most of us realise, soft furnishings need to be replaced regularly as they wear out quite quickly. I'd suggest updating cushions and replacing with them with super soft velvet cushions in gorgeous new shades of pale grey, aqua and soft pinks. 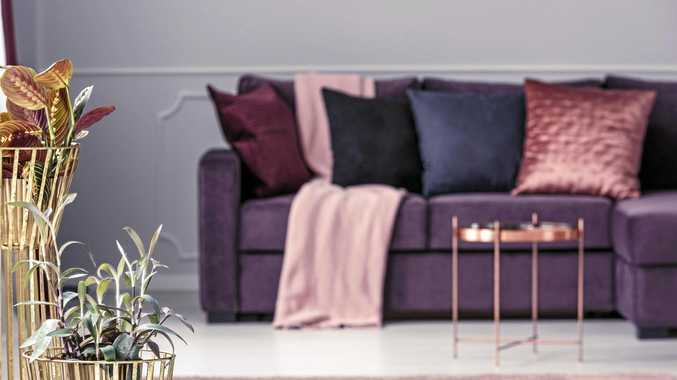 The perfect velvet sofa would be the piece de resistance to any living room and you can now find just about any style of sofa upholstered in sumptuous velvet. It's just a matter of finding the right size, shape, style and colour for your needs and tastes. Other covetous soft furnishings include velvet curtains. Not to everyone's taste but in the right space, nothing looks more palatial than lush velvet curtains spilling on to the floor. For the full effect, add regal-looking tassels and fringing to accompany your opulent velvet curtains. Finally, velvet really comes into its' own in the bedroom. The soft, luxurious feel of the fabric and the rich jewel colours of a velvet bedhead or bedcover, or duvet sets can transform your bedroom into a sensuous sleeping chamber.